Corrugated Plastic is a versatile and cost-effective material used in a variety of packaging and retail applications. We stock a wide range of board grades and colors, enabling us to provide quick turnaround for your specific needs. 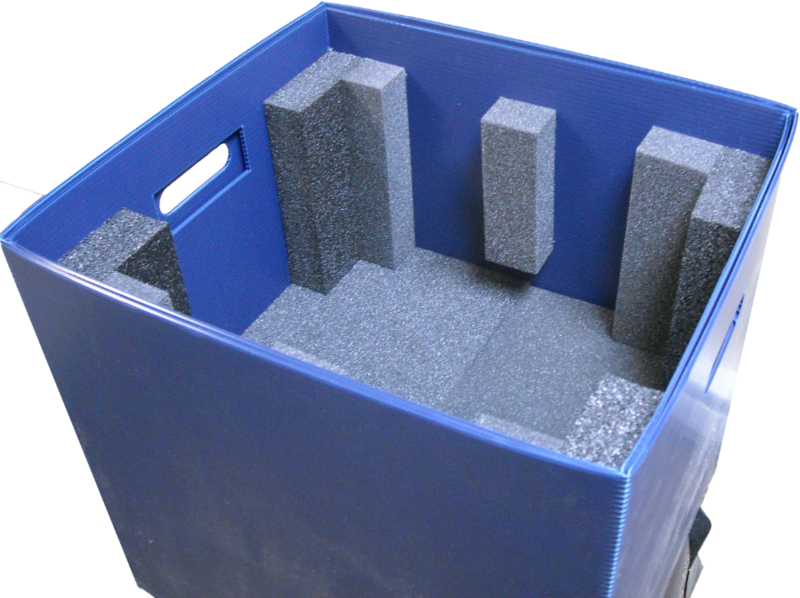 We offer storage containers, totes, trays, and boxes, all in multiple sizes and shapes. Our corrugated plastic packaging may be customized for promotional, production, inventory, storage, material handling and returnable container applications. It has been used successfully in appliance, medical, pharmaceutical, ​automotive, food, moving and other industries. Custom plastic trays are durable, rigid and economical. For use in inventory control, shipping or production control, plastic trays offer an alternative solution to corrugated, metal or vinyl trays. Multi-site retailers and manufacturers often use returnable packaging systems. These systems allow for less waste and more efficiency in moving product between distribution centers, retail stores and manufacturing plants. We can not only create the packaging itself, but also help create the system for moving your product. We can make in store displays out of corrugated or plastic. Our team can design, print, manufacture and assemble your display, no matter how complex or how many colors. We can then handle your logistics and ship the displays nationwide. Packaging Partners’ innovative plastic packaging products are designed and manufactured to protect an extensive range of products from damage during shipping and storage from climatic, electrostatic, magnetic, contamination or mechanical damage. The packaging materials used have a wide range of applications and sizes but are generally take the form of boxes or tubes which provide sealing, insulation, cushioning, bracing, support, blocking and stackable storage options. They are particularly useful in preventing damage or destruction of fragile items and equipment. Much of a plastic packaging product’s ability to meet its requirements relies on the design of the container used. 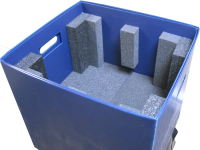 The essential qualities of any protective packaging container are that it must be crushproof, easy to assemble, lightweight and either recyclable or reusable. Design of corrugated containers takes in to account crush resistance, burst strength, bending strength, impact resistance, shock absorption, component mass, and tear resistance. The materials used in the manufacture of these containers must meet design and customer specification, and it is essential that the design allows for stackability and conforms to client volumetric requirements. The basic structure of plastic corrugated packaging is a layer of corrugated material sandwiched between two flat layers to create a board. Stronger boards may require multiple layers of flat and corrugated materials. Layers may be colored to meet customer requirements while outside surfaces may be decorated and printed or coated in various protective materials. At Packaging Partners, we can manufacture standard and non-standard corrugated packaging using paper or more bespoke products incorporating a range of preformed corrugated plastic materials. Recent trends in the consumer retail industry have seen an increase in demand for specialised corrugated containers that are directly arranged and displayed in-store to improve efficiencies and drive down handling cost while still having aesthetic appeal. We are at the forefront of packaging innovation, developing a large range of plastic corrugated packaging offerings to meet your specific requirements while limiting their impact on the environment by focusing on reusability and recyclability. Our highly skilled designers, graphic artists and manufacturing team are ready to provide you with the ultimate packaging that will get your product from source to end user efficiently, safely and at the lowest unit cost. The materials we use conform to a number of international ISO industry-specific requirements. Recently introduced international shipping regulation now restrict the use of reusable wooden containers and pallets, increasing the demand for plastic substitutes.